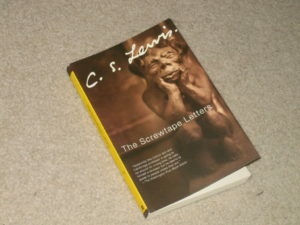 Screwtape Letters is a book by C.S. Lewis from the perspective of a highly placed demon to a novice tempter on how to properly tempt his “patient”. It is an absolutely phenomenal book and is among my favorites. In this post, I would like to highlight some of the principles that this book talks about. This book reveals some tools to defeating the temptation that demons use against us. Some people may not believe in demons, but the Bible confirms their existence when it talks about the many demons that Jesus and the disciples cast out during their ministries. They are afraid of what happens when someone gives himself to God and denies himself. They know the danger of a person who has abandoned his will to follow his Father’s will. Demons are defeated when they cannot keep their patient from following God even when He seems to have forsaken them. It is in blind faith that the Lord can best guide someone, only when they are not worried about where they are headed and choose to follow. This means that someone who thinks going to church, tithing a lot of money, and generally acting ‘good’ will save them is just as beneficial to Satan’s cause as a murderer or adulterer. moderate Christians are, in a way, more beneficial to his cause because they are less prone to repentance because they cannot feel that they are doing anything wrong. A murderer who relishes killing is still able to feel and therefore can sense good, while someone who kills because he is bored gains no real feeling from that and is also numbed to every sensation. The pious churchgoer wouldn’t feel a call to return to God because he has no idea he is doing anything wrong and never feels the affects of good and evil. Are you willing to set aside your self will and no longer be moderate in your faith? Darrel, thank you for that summary and for the challenge at the end. Darrel, great job. If you ever get a chance to see Screwtape Letters at Clowe’s, it is well work the time and cost. Max McLean has produced several C.S. Lewis books and we are never disappointed. We all can learn from Lewis. Thank you for sharing your insights. Right on! I love that book, too!